The Planning Policy team is responsible for providing planning policies to guide future development in the district. These policies will be set out in the Development Plan Documents (DPDs) and Supplementary Planning Documents (SPDs) listed below. use the Planning Policy Index which lists all of the pages available within the Planning Policy website which is kept as up-to-date as possible. The Planning Policies Maps are available via the Services in Your Area, for more information click here. The Placemaking Plan - Bath and North East Somerset Council’s Placemaking Plan was formally adopted by the Council on 13th July 2017. 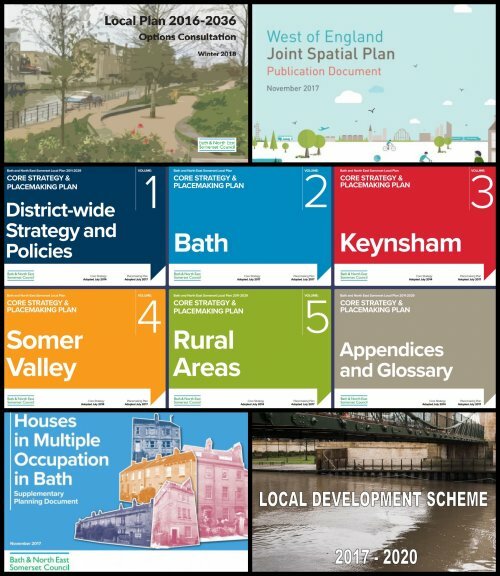 The Local Development Scheme (LDS) includes the published programme and timetable of forthcoming Planning Policy work. Please consult it as it is updated when the programme or schedule changes. If you cannot find the information you want, or if any hyperlinks are broken, please contact the Planning Policy Team using the contact details available on this page. Planning Applications: Information, advice and guidance on Planning Applications from the Development Management team. Transport Policy in the county. Public Consultations: Sign up to the Council's e-consultation facility to be notified of any upcoming consultations and to respond to consultations online. Local research and statistics for the county. All Planning Policy publications are available free of charge on our website. Unless stated otherwise our documents are provided in PDF format. To read them you will need to ensure that you have the free Adobe Reader software installed on your computer. We try to ensure the PDF files are compatible with as many versions of Adobe Reader and test the files to ensure this. If you experience problems with reading the files you may benefit from downloading the latest version of Adobe Reader. This is available in both PC and Mac versions from http://get.adobe.com/uk/reader/.